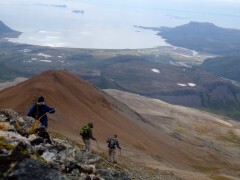 Alask Wilderness Safari camp is located in the Alaska Peninsula National Wildlife Refuge. 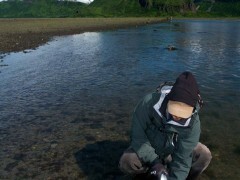 Alaska Wilderness SAFARI is located approximately 120 miles south of King Salmon, Alaska on the Pacific side of the Alaska Peninsula in Nakalilok Bay. We are surrounded by the 3.7 million acre (about the size of Connecticut and Rhode Island combined) Alaska Peninsula National Wildlife Refuge, which is managed by the U.S. Fish & Wildlife Service. Please thank the Wildlife Service for managing and preserving such lands, as there are few places on Earth as pristine as this region. Limited and challenging access to the area allows us to operate here without fishing with other fishermen from other lodges our entire season. Literally. The camp sits atop a high bluff overlooking a beautiful tidal estuary and is bounded by the North Pacific Ocean on one side, and the Aleutian Mountain Range on the other. Our close proximity to both the ocean and the mountains gives rise to a diverse range of ecosystems and geographic features unique to both sea and land. 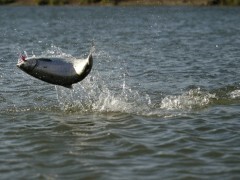 More importantly, fish are in peak condition as they enter the nearby freshwater systems for their spawning migration!